unquestionably a major reason why FREAKS has remained a cinematic legend. They are indeed highlights of the film, the torrential downpour being a Browning tour-de-force in which the only sounds are assorted groans, screams and the elements of nature. Nevertheless, for all that can be said of it, the chase sequence is far too brief. We must be content with the one glimpse of Cleo's face and the freaks in pursuit the camera affords us, although a longer series of shots, with Cleo racing . . . falling . . . struggling to make her way through the forest with various innocent shadows playing amongst the trees and undergrowth, climaxing in a similar way, would have made the sequence even more memorable. 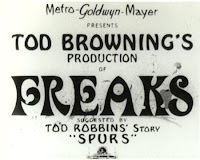 There remain, admittedly so, the couple of marvelous close-ups of the freaks propelling themselves through the mire towards the mortally wounded Hercules (there appears to be some footage missing here, for the strong man's fate is never actually explained in action or dialogue; an original plan was to have him emasculated, but as the film exists now, it is assumed that the freaks murdered him). Had Browning chosen to insert additional shots such as these, the result would have been even more satisfying.